Tinderella Syndrome – Is it Real? As online daters and those downloading the Tinder mobile dating app continue to watch Tinder explode, it’s no wonder that researchers, psychologists, and dating experts all have opinions on whether Tinder is helping singles or is just a game for people to play on their cell phones as they swipe left or right at the millions of profiles nearby. On WCCO in Minneapolis, I spoke with radio show host John Hines about the pros and cons of Tinder, using mobile dating apps, and why I think Tinder can help women who are shy to connect with a potential date online and meet them offline. Listen to our radio broadcast from August 14, 2014 at 11:00am on WCCO. The Daily Mail ran a story claiming that ‘Tinderella syndrome’ was ruining the love lives of women to the point that they wer unable to approach men in person offline. They went as far as saying that flirting techniques have been diminished due to the frequent use of the Tinder mobile dating app. While psychologist Emma Kenny believes that online dating breeds impatience and insecurity since women are inundated with an abundance of potential dates that they become overwhelmed and stop investing the same effort into meeting dates offline. Sure online dating is a numbers game and Tinder is responsible for over 10 million matches a day as well as 850 million swipes a day. Those are big numbers and it’s easy to fill your date card. Remember, not everyone on Tinder is looking for a love connection. Tinder’s founders believe that they are a social discovery app and that using the site an help make new friends with similar interests. Some will use Tinder as a game and keep playing after a swipe or two. Others will take the time to read the profiles of potential matches before starting a private online chat that will hopefully lead to an offline meeting. Otherwise, you’ll just end up with a digital pen-pal, if that’s what you want. Here are the reasons I don’t believe in the Tinderella Syndrome. 1. Mobile apps make it easier to connect with people close by. Those who are interested in meeting someone close by can easily log onto Tinder and view a profile instead of just swiping left or right to give a thumbs up on a profile. If the profile indicates they’re really looking to meet someone for a relationship, they can start chatting instantly if it’s a mutual match. 2. Almost 35% of married couples met online. A study from the journal Proceedings of the National Academy of Sciences, showed that about 1/3 of marriages were as a result of online. 3. Pew Research states that 59% of Americans think that online dating is a good way to meet people. With over half of Americans thinking online dating is the way to go, remember that most singles are using mobile dating apps, which speed up the process. 4. Mobile dating apps and online dating sites help those who are shy communicate with potential dates. It’s my opinion that using dating apps and dating sites only helps those who are too shy to approach someone in a bar to say hello. By chatting online, I think self-esteem can be improved and communicating skills with potential dates will also become easier. The key is to take your relationship from online to offline and meet IRL. 5. Online dating stigma is pretty much gone. It’s a matter of time that the stigma for Tinder or mobile dating apps for hookups will also diminish. Already we are seeing many relationships of couples who’ve found love on Tinder. 6. If your mutual match isn’t communicating with you or interested in meeting, just move on. Tinder reports they are seeing 10 million matches a day and 850 million swipes per day. With all of that activity, it’s pretty easy to figure out who’s playing the game and who will want to meet. If their profile is rather empty and they only say, “hey,” it’s probably not going to become a meaningful relationship. In my conversation with John Hines from WCCO – CBS Radio, I told him that Tinder is known to have a membership base of mostly 18-34 year olds. Many aren’t looking for a serious relationship and are hooking up. But some are truly looking for a new digital outlet to find a date or love. Yes Tinder is like a game and it asks you to keep playing instead of suggesting that you meet in person. There will always be those who love the digital ego boost of flirting online, with or without Tinder. However, there will always be those who truly are looking for a connection. Tinder makes it easy to connect. It’s up to you to decide if the relationship is ready to move offline. As time goes on, more-and-more singles in their 40s and up will also be using Tinder, due to the ease of creating a profile and the flexibility of connecting on the fly with singles in their geographic area. 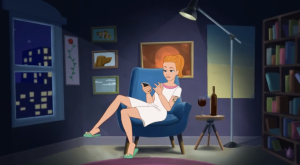 College Humor came out with a cute parody about Tinderella – a Modern Fairytale worth sharing. Julie Spira is an online and mobile dating expert and founder of CyberDatingExpert.com. She was an early adopter of online dating and mobile dating and helps singles find love on the Internet with her Irresistible Profiles programs. For more dating advice follow @JulieSpira on Twitter and sign up for the free Weekly Flirt newsletter.